Inbox Zero is an approach to managing your email where you keep the number of messages in your inbox equal to zero or as close to it as possible. It’s important because in today’s email dependant world, the inbox can be a pit filled quicksand, bogging you down and getting you stuck. Resulting in you loosing time, that should have been spent doing something more productive. Our good old human brains love to procrastinate or try to do a hundred things at once. Even if you have read and dealt with all your messages, you could still have thousands or more messages sitting in your box tempting your brain to run off on half a dozen tangents at moments notice. If your inbox is empty, then you can more easily maintain your focus and keep the precision you need to be as productive about your day. The amount of time you can lose by living in your inbox, can quickly become overwhelming, if you are checking inbox ten, fifteen, twenty or more times a day, that’s how you get caught in the inbox quicksand. Reducing the amount of time you spend in your inbox helps you focus on the task at hand, stops your brain going on a tangent and trains you to deal with email as quickly as possible. Set up some timers to remind you when to check on your inbox and then devote 30-60 minutes to deal with what’s going. Then leave it and go back to other work. I find checking first thing in the morning again in the afternoon around 2pm and again the evening works quiet well for me. Find what schedule works for you. Aim for 1-3 times a day, but don’t get discouraged if it takes some time to whittle down your inbox diving to a desired number. You will get there and you will be surprised by the amount of time you reclaim. You can keep a text file with your formatted responses and just copy and paste as needed. I use Gmail’s built in canned responses, and recommend you try them out too. Here is where you can find them, in settings under the gear icon. Then under the Labs tab, searched for “canned responses” and enable the Lab, if anyone is interested I will gladly write up a more detailed tutorial for using canned responses at a later date. You can manage your responses from with the compose form. This one is pretty simple, turn off all notifications that sound off for when you receive a new email. Including on your phone or tablet. If you don’t have alerts beeping at your every fifteen minutes you can focus on the task at hand, not being distracted by your email, until it’s time to deal with your inbox again. You or your PA can quickly scan who it’s from and subject line, and make a judgement call about what label needs to be applied. The things that need to answered immediately today go into “urgent” and things that can wait until tomorrow go into “less urgent”. Anything left in the inbox after this sweep is either spam or something you don’t need to see every time but probably shouldn’t delete, like software updates, or automatically generated status reports, cron jobs, etc. For these you should create rules and filters to deal with. If you followed my tips above, there should be very little left in your inbox proper, anything that you need to keep, but don’t need to view every time. Things you only need to see when something goes wrong or when you are doing your accounts. All these can be handled automatically with filters to keep your inbox every closer to inbox zero. Creating a perfect and nuanced filter is an art form in itself. 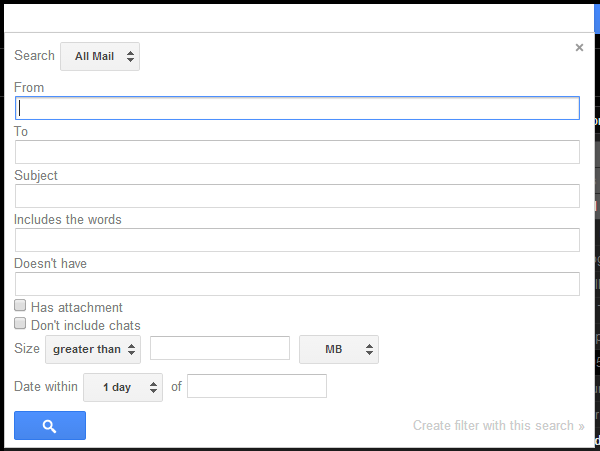 If you haven’t used them before they can filter messages as then hit your inbox, and allow you to automate what happens to them given certain criteria. The most simple one is if a subject contains a specific words, apply a label to it. The next panel determines the action to be taken with the email, So following our Roger example, we will want to apply a label, you can choose an existing one, or create a new one. 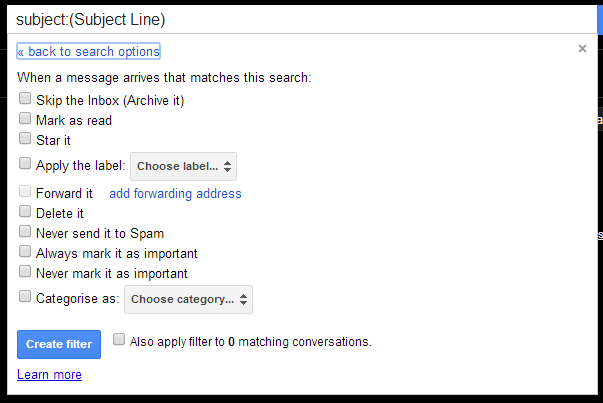 Now the most important thing is to check the box marked “Skip the Inbox” This will ensure the message only appears under the chosen label. You can also check “Mark as read” if you want. I usually do this for status messages I don’t ever need to read unless something has gone wrong. That way it doesn’t contribute to your “unread messages” number. 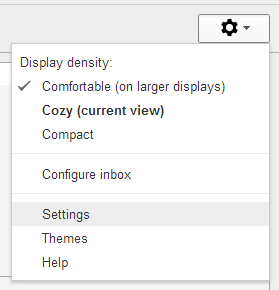 Click “Create Filter” and you should be that much closer to a tidier inbox. I hope you found these tips helpful, if you liked them let me know, or consider subscribing to the mailing list to keep up to date on all the other great tips from Dash Dot Development. I can’t put more hours in the day, but if you follow my tips I can make it seem like it. This entry was posted in Productivity and tagged email management, productivity by Sean. Bookmark the permalink.